An old man and old woman are poor. The old man goes into the market to try and sell his umbrellas, but no one buys any. When he is walking home he sees the じぞう (Jizo statues) have snow on them so he puts the umbrellas on them and goes home. In the morning the old man and woman discover food outside their home. The じぞう must have left it as thanks. I think this is a really interesting folk story within a graded reader. 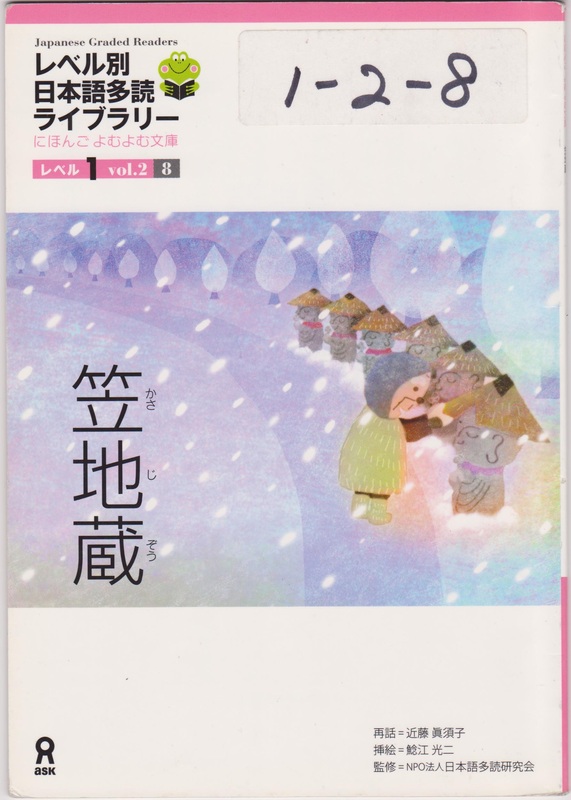 It gives good insight into Japanese culture. However, it is a rather difficult read for a first year first semester student. 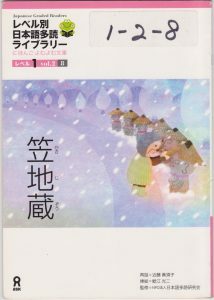 I would recommend this book if you are in your first year of Japanese and looking for a challenge. It would also be a good read for someone starting their second year of Japanese. Thanks for the recommendation! I gave this book a shot and enjoyed it, too. It was challenging, but folk tales are always interesting.